Russia began quality control fruits and vegetables from Hungary, Greece, as well as India in order to begin imports, said Aleksey Alekseenko of Russia’s food inspector Rosselkhoznadzor. Next week products from Cyprus will undergo similar tests. “Approximately two dozen companies in Greece will be tested, the same number in Hungary, and four or five in India. Due to technical reasons, Cyprus asked for a small ‘time out’, so testing will begin on April 27 where we will check six to eight companies,” Alekseenko told Russian media Monday, Rossiskaya Gazeta reported. 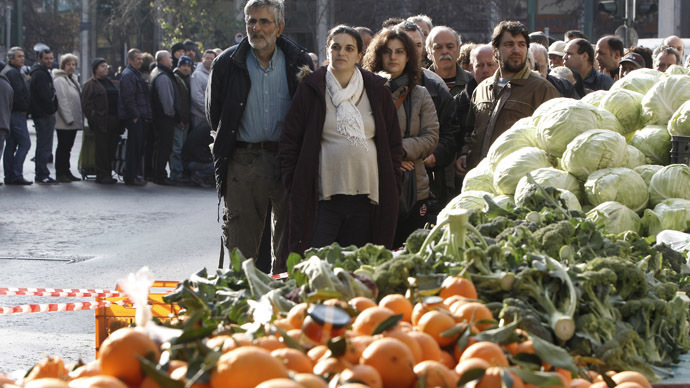 EU countries Greece, Cyprus, and Hungary have all asked Russia to cancel or reduce the food import embargo they face. However, during Greek Prime Minister Alexis Tsipras’ visit to Moscow two weeks ago, Russian President Putin dismissed the possibility. One way countries could get around the sanctions is to set up joint ventures with Russian companies. Inspection should be finished by April 30, and the preliminary results will be published immediately, with the final results a few days later, according to Alekseenko. Russia’s agricultural food import ban on EU countries doesn’t expire until August, a year after the restrictions were imposed in response to Western sanctions. The ban also applies to the US, Australia, Canada, Japan, and Norway and includes meat, fish, chicken, cheese, milk, fruit, and vegetables. Researchers at the Gaidar Institute, the Russian Presidential Academy, and Russian Academy of Foreign Trade and Economic Development calculated that Russia has reduced its agriculture imports by 40 percent, and exports have decreased by 25-30 percent. The measure was taken as a counter to sanctions imposed by Western countries on Russia, but is also believed to boost domestic agriculture. By banning imports, Russian farmers would have to boost production and in theory start producing better products.